Wired keypad to allow access via a 1-6 digit entry code. Housed in a weatherproof metal enclosure. 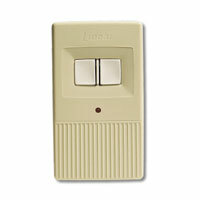 This wired keypad (Model AM-KP) is an outdoor entry device that activates one relay channel. 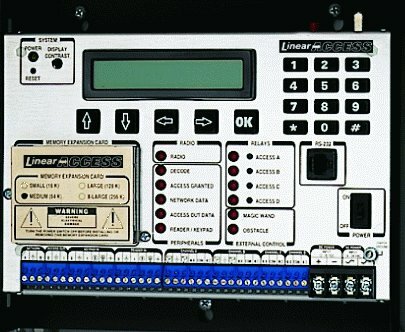 When a learned one-to-eight-digit access code is entered, the AM-KP causes a Linear access controller to activate one of its four relays, which in turn, performs an action, such as releasing a door strike/magnetic lock or triggering a gate operator. 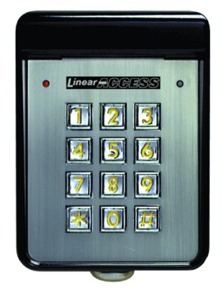 The keypad is built for extended service in tough commercial access control environments, outdoors or inside. It is housed in a weather-resistant, cast aluminum case. A built-in piezo sounder provides audible confirmation to the user when a key is pressed. A red LED indicates “power” and switches to green when a valid entry code is entered. A separate yellow LED illuminates when the keypad is licked out. Lockout can be programmed to occur after one to seven unsuccessful entry code attempts and will remain in that condition for one full minute. A built-in downlight provides keypad illumination in even the darkest conditions. It is completely programmable: on all the time or timed intervals. The keypad is powered by a system controller and can be located up to 500 feet away. 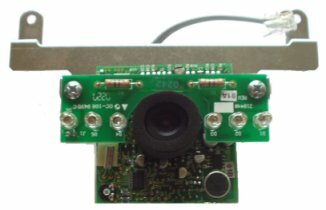 A local external 12 Vdc power supply is also available. A keylock secures the keypad to the mounting backplate. For use outdoors or indoors. 1-to-8-digit user selectable access codes. Separate LEDs for “power/access granted” and “locked out” indication. Cast aluminum, environmentally protected housing. Keylock secures keypad to mounting backplate.